Who invented Morse Code? The name of the inventors credited with inventing the Morse Code are Samuel Morse (1791 - 1872), the famous inventor of the Telegraph, and his assistant Alfred Vail (1807 – 1859). Samuel Morse is not only famous as the American co-inventor of the Morse Code but also as a portrait artist, entrepreneur and businessman. Alfred Vail and his father were also the financial backers of Samuel Morse and the telegraph. When was the Morse Code invented? Samuel Morse and Alfred Vail invented the Morse Code in 1838, during the First US Industrial Revolution (1700 - 1860) period of invention. The invention of the Morse Code originated in America and is considered an outstanding achievement in the field of Communications. Definition of the Morse Code: The Morse Code is defined as a method of sending text messages by a telegraph code in which letters and numbers are represented by strings of dots and dashes (short and long electronic pulses or signals). A short pulse is called a "dot" and a long pulse is called a "dash". Fact 2: Who invented Morse Code? Prior to the invention of the Morse Code and the telegraph in 1838, there was there was a non-electrical telegraph which was invented by Claude Chappe in 1794. Chappe's system used a visual system called semaphore (a flag-based alphabet) that was totally dependent on a line of sight for communication. Fact 3: Who invented Morse Code? Samuel Morse, was born on April 27, 1791 in Charlestown, Massachusetts, United States and died on April 2, 1872. His co-inventor Alfred Vail was born on September 25, 1807 in Morristown, New Jersey, United States and died on January 18, 1859. Fact 4: Who invented Morse Code? Samuel Morse and Alfred Vail were driven to such a degree that they were destined to achieve importance as the American inventors of the Morse Code. Fact 5: Who invented Morse Code? The early years of Samuel Morse were spent in Charlestown, Massachusetts, United States where he was raised by his family. Samuel Morse was educated at Yale College. Alfred Vail was educated at public schools and then attended New York University where he studied theology. Fact 6: Who invented Morse Code? Both Samuel Morse and Alfred Vail came from wealthy families. The father of Samuel Morse (Jedidiah Morse) was a theologian and a a noted geographer. The father of Alfred Vail (Stephen Vail (1780–1864) was an industrialist and entrepreneur who founded the Speedwell Ironworks. Fact 7: Who invented Morse Code? Alfred Vail began working in his father's Ironworks as a machinist, modifying metal parts where he gained experience in working with blueprints and engineering drawings. Fact 8: Who invented Morse Code? Samuel Morse started work as a clerk at his father's book publisher but his passion was art and he to England to attend the Royal Academy of Arts in London. Samuel Morse went on to become a highly successful portrait artist. Fact 9: Who invented Morse Code? Both Samuel Morse and Alfred Vail developed a great enthusiasm for science and technology. It was the beginning of the Industrial Revolution and Morse and Vail had the connections to keep abreast of new inventions. They were both deeply interested in electromagnetism and electricity. Fact 10: Who invented Morse Code? The lives of the men came together when, on September 2, 1837, Alfred Vail witnessed one of Samuel Morse's early telegraph experiments. Fact 11: Who invented Morse Code? Samuel Morse and Alfred Vail struck a deal to develop the telegraph technology at Speedwell Ironworks near Morristown, New Jersey. Vail agreed to develop the project at his own expense (with his father's financial backing) in return for 25% of the proceeds of Morse's invention of the telegraph. Fact 12: Who invented Morse Code? Samuel Morse went on to take congressman Francis O. J. Smithas a partner and reduced the Vails' share to one-eighth. Samuel Morse also retained patent rights to everything that Alfred Vail developed. Fact 13: Who invented Morse Code? 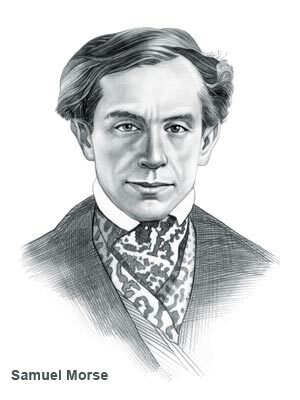 Samuel Morse created "relays," where one electric circuit is used to open and close a switch on another electric circuit that was located a distance away and discovered how to use the flow of electric current to make a code that could be sent along the wires. Fact 14: Who invented Morse Code? It soon became evident that if a man sending a message at one end of a line of wire pressed down a key, electricity could be made instantaneously to automatically press down another key at the 'receivers' end of the wire where the receiving machine marked a moving strip of paper. Fact 15: Who invented Morse Code? Samuel Morse then invented the 'Morse Key' that could create short and long bursts of electric current (called pulses) using long or short taps on his Morse-Key machine. He and Vail then decided that they needed to create a code that could make impressions on the moving strip of paper. Fact 16: Who invented Morse Code? Alfred Vail and Samuel Morse realized that if the man at one end of the wire held his key down for only an instant, the impression on the 'receivers' paper would look like a dot and that if the key was held down a little longer, the impression would look like a short dash. Fact 17: Who invented Morse Code? Alfred Vail and Samuel Morse started working on a way to use the dots and dashes to relay messages. The dots and dashes were combined in a number of different ways so as to represent the letters of the alphabet. The Morse Code was born - a dot/dash code was used for each letter of the alphabet . Additional combinations of dots and dashes were added to the code to represent numbers. With the use of the code the telegraph could be used to send messages over long distances. Fact 18: Who invented Morse Code? The first telegram was sent on 11 January 1838, across two miles of wire at Speedwell Ironworks. The first message in code read "A patient waiter is no loser"
Fact 19: Who invented Morse Code? Alfred Vail worked on Morse's prototype telegraph to make it suitable for public demonstration and commercial operation. Fact 20: Who invented Morse Code? The new fangled telegraph system, with its dot/dash code, to a sceptical Congress, but it took a few years before Congress would fund the new telegraph system. In 1843 congress provided funds of $10,000 and the first telegraph line ran for 30 miles from Washington, D.C., to Baltimore, Maryland. Fact 21: Who invented Morse Code? On May 24, 1844 a telegraph message was sent from Alfred Vail at the Baltimore and Ohio Railroad asking "What is the news from Washington?" Samuel Morse, who was in Washington, replied by telegraphing the latest political news. Fact 22: Who invented Morse Code? The invention of the telegraph and the code coincided with the construction of the railroad across America. The telegraph system carried code signals across the land by wires supported by telegraph poles. As the land had been cleared for the railroad it was a simple task to set up telegraph poles alongside the railroad tracks to carry the telegraph wires. Fact 23: Who invented Morse Code? Samuel Morse received a patent for the telegraph in 1847 and Alfred Vail retired from the telegraph operations in 1848. Alfred Vail received limited acknowledgement for his work and as he held such a small percentage of the invention, and Samuel held all of the rights, Alfred Vail received realized far less financial gain from the Telegraph and the Morse Code.